Don’t let my long yoga lingo scare you. Any and all the terms yoga instructors use can be broken down and defined to make it easier for you to master them. First things first: asana (/ˈäsənə/), Sanskrit for “manner of sitting” or “a sitting posture” is the word used for any of the various yoga postures. Originally, asanas were developed by yogic sages to be used as comfortable meditative postures, since meditating has no real time limit involved. Now that I have introduced that term to you, let’s learn about one of my favorite yoga poses. 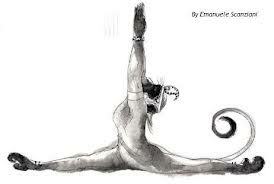 All asanas have an accompanying story behind them, and one of my favorites is that of Hanumanasana. During mythological times, Rama, a king of ancient India, had a problem. Ravana, the demon king who presided over Sri Lanka, had abducted Rama’s wife, Sita. Rama and his troops embarked on a journey to rescue Sita from the vile demon, but during the battle Rama’s brother, Laksmana, was severely wounded. The only way to save him was to procure an herb that grew far away in the Himalayas. Just when it appeared that he would be lost, Hanuman, Rama’s greatest devotee, volunteered to accomplish this seemingly impossible task. He took one mighty leap that stretched all the way from the south of India to the Himalayas. Not knowing which herb to pick, he carried the entire mountain with him as he made another massive leap back to the battlefield. The healers found the herb in question, and Laksmana’s life was saved. That giant leap demonstrated Hanuman’s love for Rama giving meaning to the idea that great power can come from devotion. Hanuman’s leap is memorialized in the pose Hanumanasana, a pose that asks you not merely to stretch your legs but also to bring true devotion into your practice. Hanumanasana expresses the expansiveness possible when devotion is in the heart. It is the sense that any obstacle can be overcome when desire to help is combined with reverence and respect, as long as it is accompanied by devotion. This asana helps you strive to reach much further than seems humanly possible. The magnificent posture that results from striving to do Hanumanasana becomes meaningful when you become aware of the duality between your reach for the pose and the pains that may accompany your attempts. The discomfort of attempting to do this asana forces us to turn our minds inward, and I encourage my students to use their breath to access their heart to find the inner passion that created the leap of Hanuman. When you switch the mind from pain to passion and do the asana with a sense of Hanumanic devotion, amazingly enough resistance begins to lessen and the pose starts to blossom. As the mind turns, so the body responds and as your heart opens, so will your hips, hamstrings, and legs. Hanumanasana is a pose that figuratively splits us in two, helping us to gather extra power to extend ourselves further in the quest to find joy even when we are feeling frustrated, challenged and over-stretched.